A new Alusync model is about to be released in Australia. The vision to bring new acdc tig welders for sale in Australia from Tokentools Welders has been an ongoing project spanning more than a decade. 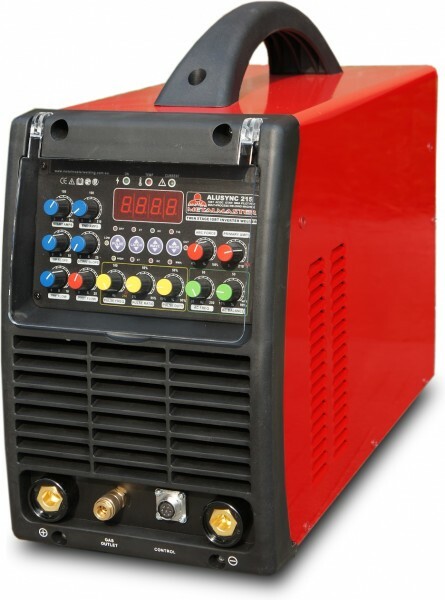 The New Metalmaster Alusync 215 Inverter ACDC Pulse Tig Welder and Plasma Cutter runs from a single phase 240 volt outlet but requires 15 amps connection. The machine has full arc control, AC & DC TIG Welding / AC DC MMA, HF TIG Welding ignition and is also a multi process power source with integrated Plasma Cutter. Standard features on this machine include high frequency arc ignition, up and down slope, pre flow adjustable AC frequency with a massive 10 to 300Hz range, repeat (latch) function, MMA welding and integrated plasma cutter functionality. The IGBT inverter core transistors are manufactured by Infineon and siemens, these IGBTs are chosen for their ability to provide dependable power in the toughest of environments. We believe the Metalmaster Alusync 215 will empower you to have one inverter TIG MMA welder and plasma cutter ready to attack and conquer any job you put to it.